Two days after a week that saw over 40 inches of snow land on Boston, residents using the city's "Citizens Connect" online and social media service are flooding Mayor Marty Walsh's office with complaints about uncleared sidewalks and unplowed streets. Under city code, residents and businesses are responsible for clearing a 42-inch-wide path through the snow on the sidewalks in front of their property. Fines can range from $50 a day for homeowners to $200 a day for businesses. Dodging corner-blocking snow piles of snow on Dorchester Avenue as he walked back from the Carney Hospital to the Ashmont Red Line station, Mark Matthews of Wells, Maine, said he was decidedly unimpressed with how the big city -- and big city people -- had done cleaning up from the storm. "Up in Maine, we're used to it and deal with it all the time. It's definitely a big difference," Matthews said. Giant snow piles like those snarling Dorchester Avenue at Alger Street and Becket Street and other locations in Wells "would get knocked down with payloaders and hauled off." 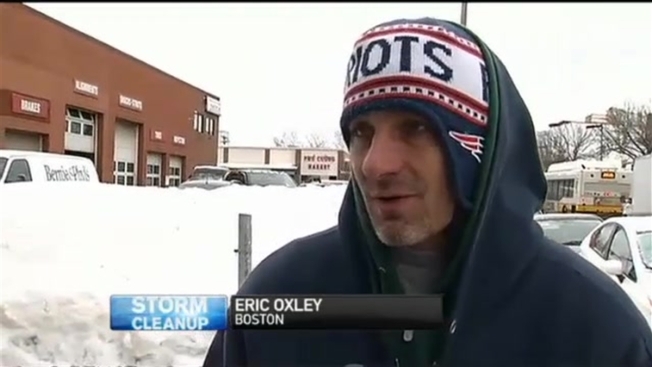 Eric Oxley, a Saugus native now living in Boston who has been working 12-hour shifts clearing snow with a loader, said, "People are out working very hard, and they're doing a good job, but it's still a little messy and unsafe. So just take it easy is what I would suggest."